Pro-Tekt is a nutritional supplement that increases your plants resistance against heat and drought. It also creates a natural barrier against insects and disease. In hot weather, plants release moisture at their leaves to keep cool. 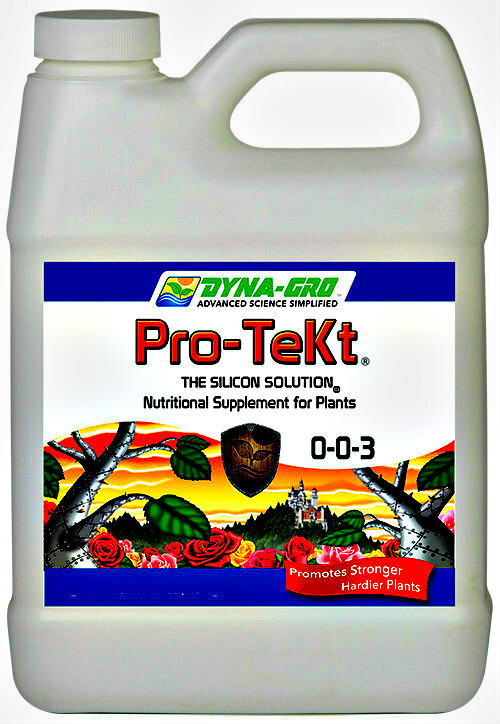 Pro-Tekt adds potassium and silicon to your nutrient solution which builds stronger cell walls in the plant. Stronger cell walls reduce the loss of moisture at the leaves in hot weather. Insects love chewing on plant leaves. Pro-Tekt builds stronger the cell walls in your plants, creating a natural barrier against insects. Pro-Tekt was orginally designed to protect hydroponic vegetable crops from insects without using pesticides. Pro-Tekt is a nutrional supplement that is added to the nutrient solution you're currently using. Add 1/2 - 1 tsp of Pro-Tekt per gallon of water. Do not mix concentrated Pro-Tekt with other concentrated nutrients - mix only when ready to use. For best results use every watering.